Gracepoint Church is a proud member of the Cooperating Christian Churches of Oroville (CCCO). The CCCO is a cooperating group of local Oroville churches working together to better serve our community. The CCCO sponsors an annual “Oroville Hunger Walk” as well as various other community services projects throughout the year. Current members of the CCCO include: First Congregational Church of Oroville (www.fccoroville.org); Trinity Presbyterian Church (www.trinityoroville.org); First United Methodist Church of Oroville(www.1stunitedmethodist.org); Trinity Bible Church; Oroville Hope Center (http://orovillehopecenter.org); Oroville Rescue Mission (www.orovillerescuemission.org); St. Thomas the Apostle Catholic Church (www.orovillecatholic.org); St. Paul’s Episcopal Church (www.stpaulgold.org); The Salvation Army. A FREE creative writing workshop presented by Gracepoint Church in partnership with "The VOICE" (a local area youth magazine) on Wednesday from 10am-2pm. Professor Shelly Hart from California State University Chico was the lead facilitator. This was a great opportunity for aspiring young writers of all genres to get quality feedback and guidance. The event was free of charge and open to all area youth. Created Equal: America’s Civil Rights Struggle was an initiative of the National Endowment for the Humanities (NEH) that used the power of documentary films to encourage community discussion of America’s civil rights history. The NEH partnered with the Gilder Lehrman Institute of American History to develop programmatic and support materials for the sites. GracePoint Church was one of 473 institutions selected to participate in this national initiative. 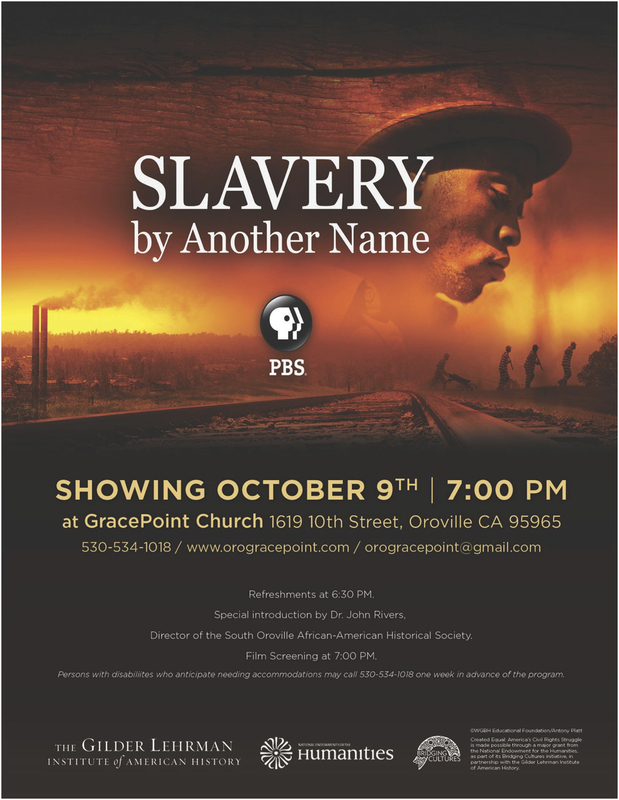 The GracePoint Church program featured three films, The Abolitionists, Slavery by Another Name, and Freedom Riders. These films chronicle the long and sometimes violent effort to achieve the rights enumerated in the Declaration of Independence—life, liberty and the pursuit of happiness—for all Americans. 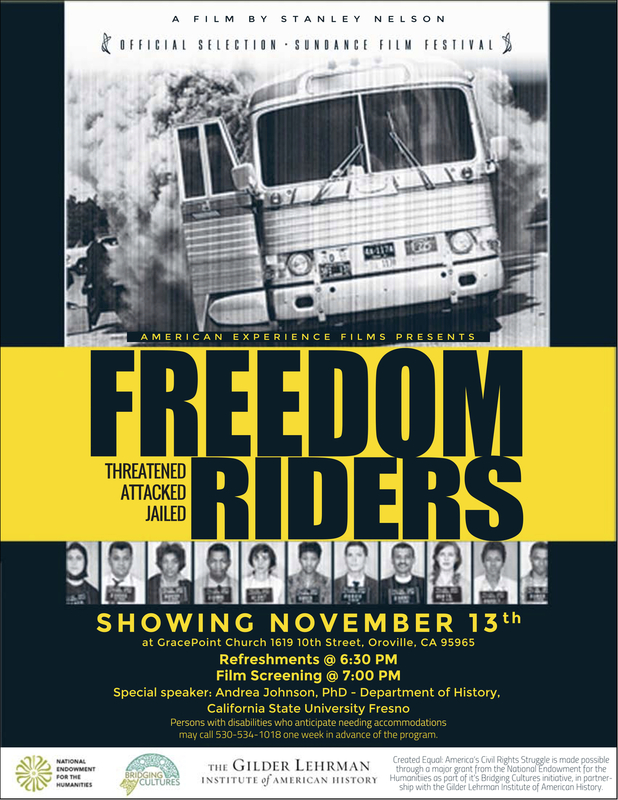 Each of the films was produced with NEH support, and each tells remarkable stories of individuals who challenged the social and legal status quo of deeply rooted institutions, from slavery to segregation. Created Equal programs bring communities together to revisit our shared history and help bridge deep racial and cultural divides in American civic life. Visit www.createdequal.neh.gov for more information.